Scandinavian Christmas jul in Denmark. It is nearly impossible to separate H.C. Andersen's vision of Denmark from the reality, for the reality is, in fact, fantastic. Wherever you travel in Denmark, you see the storyteller's characters and his settings: the castles; and the ducks that stop traffic; the pagodas; the guardsmen who look like toy soldiers; the cottages inhabited by polite, kindly people; the wild swans; the Queen in her palace; the chimney sweep toting his ladder over one shoulder; and, of course, the storks that guard their nests exactly as Andersen described them. But the fairyland is not all goodness and light. There is a dark side, a netherworld populated with mischievous dwarfs and forbidding snow queens, with wicked trolls and vicious dogs that dwell deep beneath the earth. It is this contrast between the light and the dark that creates the tension that fills Andersen's stories with mystery and pathos. The contrast is what Danes understand better than most other readers about Andersen's work. The contrast between light and dark is part of their heritage, their folklore. 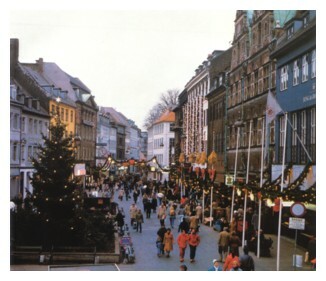 It is the same contrast that is the essence of the Danish Jul: the long, gloomy nights of December brightened by the light of so many candles; the nisser, the spirits of Jul, who must, in some way, on Christmas Eve, be appeased with a bowl of porridge; Jul, the ancient festival of Odin, that was transformed by Christianity into Christmas, a festival of light. The same contrasts - the light and the dark, goodness and evil, birth and death - that are the focus of Danish Christmas are the focus of Andersen's fairy tales. He was born in Odense, a name that means "shrine of Odin." The son of a shoemaker who wanted to be a scholar, and a washerwoman who believed in ghosts and spirits from the underworld. Andersen was influenced by both parents. He grew up to be both erudite and superstitious, sophisticated and provincial, a man of contrasts. His childhood was spent in abject poverty as well as loneliness, a past most people would choose to forget. Andersen remembered it all and used it all in his stories, many of which can be interpreted as autobiographical. The father, like the son, was something of a dreamer. He built for young Hans a puppet theater, taught the boy how to cut silhouettes from paper, and read to his son from the Arabian Nights. When the father died, Andersen's mother told her 11-year-old son that his father had been taken by the "snow queen," a mythical figure that Andersen described in one of his stories as beautiful, but cold and uncaring. Two of Andersen's tales are Jul stories. And like Christmas in Denmark, they are studies in contrast, filled with both darkness and light. The little fir tree is transformed into a glittering Christmas tree, but is far too busy worrying about tomorrow to appreciate today. The story offers a lesson Andersen may have learned through his own experiences. Cold and hungry on New Year's Eve, the little match girl, attempting to keep warm, ignites her matches and sees visions of beauty and love in the flames. Perhaps the Danes see similar visions in the flames of their many Jul candles.